Indications of shock and disbelief came from all quarters of social media from watching the Panorama program Undercover Care: The Abuse Exposed. While I had to force myself to watch, it was sadly not news for me. Like the whistle blower, disabled people have long been voicing our misgivings about how people with learning difficulties[i] bear the brunt of disability hate crime. It is not so long ago that Fiona Pilkington committed suicide [ii] because she could no longer bear the abuse; she contacted the police no less than 13 times in the year of her death. When a case such as the Panorama program highlights these real occurrences, there are knee jerk reactions and righteous noises about the support workers – and rightly so, some of them were arrested. But these abuses are, sadly, not rare and it also misses the crux of the issues. These support workers were working in an environment (and society) which has no respect or regard for disabled people. They see them as ‘patients’ to be restrained and vent their boredom in bullying and abusing the people in their charge to pass their time. There was no supervision, no managerial support. It’s all very well to vilify them but there are some bright ideas afloat that unemployed people should be sent ‘to serve the community and take care of disabled people’. Disabled people are held hostage by the label as the ‘most vulnerable’, as subjects to be ‘taken care of’ and also, in this scenario, as punishment. Support workers are badly paid and as we can see in the program, scarcely trained. I am fortunate enough to know many support workers who care about the people they support in the community but these sterile ghettos/ care institutions where people with learning difficulties are kept locked up are not the type of places they would chose to work given a choice. These ‘inmates’, because that’s what they are effectively are rather than patients, are not for all intents and purposes, ill. They are disabled people. Moreover the treatment meted out to them by being kept in such institutions causes additional mental health issues. ‘As an advocacy organisation we know that people with a learning disability are on the receiving end of abuse and ignorance, especially in the new institutions. In the Panorama expose independent advocates were completely absent. Our workers are a vital part of safeguarding the most vulnerable. One point I do think needs to be made is how traditionally there is such a risk averse approach to support for people with learning difficulties, favouring segregated institutional based care. This programme shows the extent of the dangers that are faced by people placed in exactly those type of settings that are purported to be safer for them as opposed to being supported to live independently in the community. the Quality Care Commission (QCC) clearly failed when it was given evidence of abuse on a plate which it ignored. There needed to be improvements in its systems. However as Panorama rightly identified, the core issue is that locked institutions should not be allowed to exist. The programme at times described people as “not being able to look after themselves” and as having the mental age of children, however that approach fails to recognize the abilities, talents and contributions which all people with learning difficulties have; as one of the programme experts said at the end, there is no reason why any of those people could not live better in the community with support. The privatisation of care homes must be seen as a factor contributing to the existing abuse at places such as Winterbourne. Private companies are seeking to make a profit from an industry which is already severely underfunded, the outcome can only be inadequate quality of support with the subsequent incidences of abuse. Supporting people with challenging behaviour is a complex and difficult job which requires intelligence (high levels of both IQ and EQ), understanding and training. You do not get support workers with that mix of skills and attributes for the kind of wages that the the so-called care sector pays. Not when you consider the executive salaries which are also paid out to the Directors. The coalition government is pushing for a Big Society but without state intervention and regulation to ensure people get the support they need, there is every danger, as the Panorama programme provided evidence, of cultures of abuse becoming more widespread and accepted. The programme highlights the key value of user led organisations: one of the experts described how the staff cannot have viewed the patients as “human beings just like them” in order to have engaged in the treatment they did. Where disabled people are visibly part of service commissioning and provision we can provide a constant reminder that we are indeed people just like them. If we don’t want people in our society to be abused as seen on Panorama then society needs to invest in our organisations. What we want to know is when is this austerity driven government going to see that this privatised, institutionalised care is not cheaper but that it costs disabled people and their families dear in depriving them of their human rights to live independently with support in the communities that includes them. [iii] Exploring the incidence, risk factors, nature and monitoring of adult protection alerts, Jim Mansell et al. 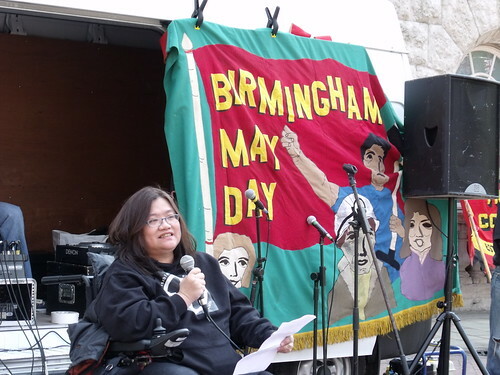 Today there was a demonstration called by Birmingham Trades Union Council to celebrate May Day— International Workers Day. May Day celebrates International Workers Day and is marked traditionally when the Trade Union Movement gathers with the community to celebrate our achievements and to commit ourselves to achieving economic and social justice for all. Birmingham TUC worked together with Birmingham Against the Cuts and invited trades unionists, students and the public to join this demonstration to stop the cuts and fight for an alternative based on our needs, not bankers greed! DPAC was there with our stall and banner at the start at St Philips Cathedral – we were to march through part of the city centre to Victoria Sq where there were speeches. I joined Matt, Linda and Paul there to hand out leaflets and chat to the people there. It was a lively crowd and people seemed genuinely interested to stop and chat and to take up handouts. There was a UKuncut group dressed up in white body suits with black tipped markings – they said the body stockings were what the UKuncut people (Fortnum and Mason Solidarity Bloc) had to wear after the Fortnum and Mason event in London, 26th march. Next to our stall was the Confronting Anti Muslim Hatred stall. There was also an anti war stall. 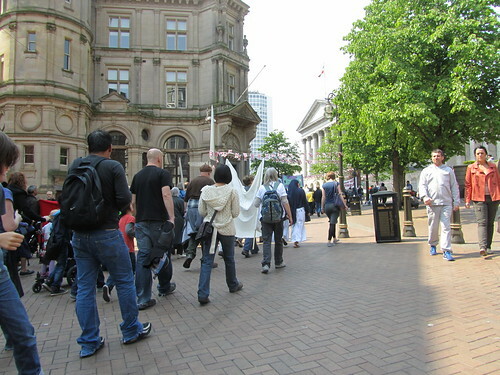 Soon after 12 noon we set out on the rally – it was a rather good natured crowd and we hardly saw any police. A bit of noise but not much chanting with a few kids. All in all, there was a rough estimate of 200 perhaps. The UKuncut group stopped outside Primark to protest about non payment of taxes I think. I wound my way through the marchers with Linda and Paul holding the banner taking photos and handing out leaflets about DPAC. Linda told me later that someone asked her if she was taking care of me and if I had enough battery in my chair to last out the march! I had an older gentleman tell me he was buying me an ice cream but it never materialise! Some of the people there were from the general public and quite a few of the older people there spoke of their own fears to me. I would have liked to be able to chat more except I had to keep up with the crowd. They were quite a few open to chatting – it might be due to the weather! We had the speeches about the cuts in Birmingham and how it affects the workers and service users in Birmingham and the recent legal case won against the council. I also read out the DPAC speech prepared for the day. Disabled people continue to face a multitude of attacks against their ability to live independently in the community and to take a full and active part in society along with their non-disabled peers. These cuts include the abolition of Disability Living Allowance, a benefit awarded to meet the extra costs of being disabled, where even before further testing of disabled people starts the Coalition government have said they will remove 20% of disabled people from entitlement to it and that we are financially unsustainable. This benefit in particular allows many disabled people to work and therefore pay taxes. 1 million disabled people – not fraudsters as many newspapers would have people believe, are also being thrown off Incapacity Benefit and forced to seek non-existent jobs. But rather than removing the barriers to work for disabled people the coalition government have put even more obstacles to employment in place and with changes to Access to Work funding, a reduction to the Health and Safety Executive and the massive reduction of public sector jobs which provides employment for far more disabled people then the private sector. Planned changes to social housing tenure and changes to housing benefits will also affect disabled people very badly and are likely to lead to an increasing number of homeless disabled people as well as pushing many into further poverty. At a local level disabled people are already losing funding for care and support and together with the closure of day centres many are becoming isolated in their own homes. Social care is not free for the majority of disabled people either and locally in parts of the West Midlands people living on already meagre incomes are being expected to pay up to £50-£60 a week towards their care. Mental Health services are also being drastically reduced in many areas due to cuts in NHS jobs and funding. While many of you here today may think that what happens to disabled people is of little interest to you it’s important for everyone to realise that most disabled people have acquired an impairment due to illness, accident, or old age., so helping us to fight for our rights and not be reliant on charity could help you or someone you care about in the future. What I believe we all share in common however is that we are all being attacked by this millionaire government and that we have to fight for our futures together. So what have DPAC done over the last 6 months? All around the country together with others we’ve made it impossible for Condem politicians to leave the safety of Westminster and go out to visit places. Here in Birmingham MPs either were forced to use the back door on several occaisons or didn’t turn up. In London Boris Johnson was seen to cycle away from a group of protesters. We need to keep this up and make sure when they venture out into the community they can’t use the front door anywhere. Secondly in Birmingham the council have been stopped from removing 11.000 disabled people from receiving care by changing the eligibility criteria, This has been partly through pressure and partly through some disabled people winning a recent legal case. Other disabled supporters of DPAC also have a Judicial Review pending against the heavily criticised Work capability Assessment for Employment and Support Allowance. A further case about Housing Benefit case is going to the Court of Appeal also. We also now have several local DPAC groups around the country as well and our campaigns against ATOS the private firm raking in millions of pounds for testing disabled people’s fitness to work are supported by politicians, union branches, and over 55 local claimant and anti-cuts groups. This campaign has so far involved three national days of action which resulted in ATOS offices all over the country, from Dundee to Truro, being closed down for the day. We have been involved in organising an International week of protest against ATOS starting on May 9th again aimed to close down their offices all around the country. We have also and will continue to picket their recruitment fares when they try to recruit vaguely medical staff to carry out their tick box computer assessments. Of those tested by ATOS and found fit for work 70% who have representation and 40 % without any representation have the decision overturned on appeal, although it can take up to 12 months to reach a tribunal hearing because there are so many cases wrongly assessed. We have also protested against the scandalous lies printed in the Daily Mail and are now involved in further campaigning against them. Its only in unity that we can achieve some success so we salute solidarity! in working together in the future. Join Million Women Rise on Saturday 5 March 2011, from Hyde Park to Trafalgar Sq. For International Women’s Day 100 years Celebration but just as importantly to show solidarity in Ending Male Violence in all it’s forms against Women and Girls in the UK and Internationally. Michelle Daley and Eleanor Lisney spoke last year for disabled women – for which there is a video with transcript. 5pm – 1am: Food and Networking Party at The 52 Club, 52 Gower Street WC1E6EB, a wheelchair accessible venue. All Women Welcome. Food, performances, swimming pool, DJs and chill–out space and raffle. Entry fee on the door – donation if unwaged, £5 low-waged and £12 waged. Live performances: Drumming, DJ Shyeye and Nicki Lucus. Door charges include swim and sauna and set for every budget but please don’t forget to bring your own swimming hat! It will be a great chance to meet the million women rise crew and Network with other women find out more about the next National women’s march 2012 or just to relax, have a swim and soak in the vibes. Call the info line on 07727 419 634 to book a place in advance. Group bookings welcomed.